When you’re planning your fall garden, you need to consider a couple of things: The type of vegetables you will be growing and the first average frost date where you live. Average frost date is easy to find out. Simply call your County Extension Office or look on a garden zone chart. A great resource to look up average first and last frost dates is Victory Seeds’ frost date selector. Vegetable selection is a bit trickier. You want to be sure that you’re selecting vegetables that are frost tolerant. 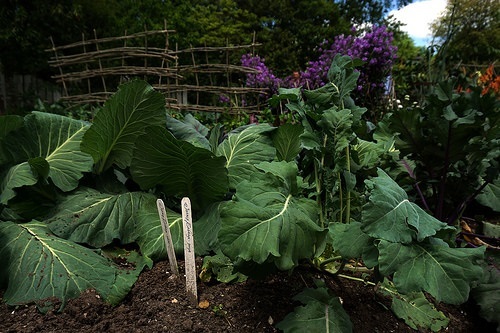 Or you can choose vegetables that are not frost tolerant if you look at the maturity rates of each one and do a bit of figuring before planting. You want to make sure the vegetables will mature before cold weather hits. If you’re starting from seed you’ll want to start them early to allow for slower maturity as the days get shorter in the fall. If you’re planting cold hardy vegetables this isn’t as critical. For plants that die back when the first frost hits, you’ll need to calculate the days until harvest. You may want to add a few extra days to allow for slower growth. This way you are able to harvest your crop before the plant dies off. As an example, a packet of cucumber seeds says it takes 50 days to harvest. If your average first frost date is September 20, you will want to plant your seeds by June first to allow for harvest before the frost. If you’re able to find plants at your local garden center, you’ll be able to plant a bit later. Using the same example of cucumbers, the seeds take eight days to germinate. If you have purchased plants, you can plant about two weeks later and still be able to harvest before the frost. If you have a very early first frost, some of these may not be an option for you. Calculate to be sure the plant will be ready for harvest in time. Some vegetables, like kale, actually taste better after a light frost. Others can be protected with row covers or a cold frame to extend the season even more. If you’re in doubt, check with your county Extension Office. Often they will have a chart detailing what can be planted each month. By following these guidelines you can have a nearly year round garden and enjoy fresh produce on your table. You can learn more by reading Four-Season Harvest by Eliot Coleman. You’ll be surprised at how much you can grow, year round, where ever you live. Fall is a great time for other garden chores as well. the planting of trees and shrubs is best done during the cool fall temperatures. Even though the air is cool, the soil is still warm and nurturing for new plants. Choose a tree that is balled-and-burlapped or in a pot as opposed to bare-root selections. Planting in early fall gives the root system time to get established before going dormant in the winter. As the tree or shrub prepares itself for dormancy, its energy is focused on the roots. This is just where the focus needs to be in new plantings. The planting hole should be two to three times wider than the root ball but only as deep as the soil line on the trunk. Do not add soil amendments to the hole. This will discourage the roots from spreading out and cause a weak plant that is easily uprooted. Grasses benefit from being planted in the fall as well. In fact, this is the idea time to start a new lawn or over-seed a thin lawn. The grass will grow faster and have less competition from weeds. Speaking of weeds, fall is the time to combat them. Because weeds prepare for winter by pulling nutrients into the roots, herbicides (if you use them) are better absorbed as well. Better absorption means better results in killing weeds. Fall is also the time to aerate if you have a half inch or more of thatch build up. Don’t forget to fertilize using a fertilizer that has slow- or controlled-release nitrogen. The N-P-K should be a ratio of 3:1:2 or 4:1:2. Fertilizer is easier to absorb after you have aerated your lawn. This may seem like a lot of work, but doing it now will give you a healthier lawn in the spring. Then you can relax while your neighbors try to figure out how to make their yards look as great as yours.